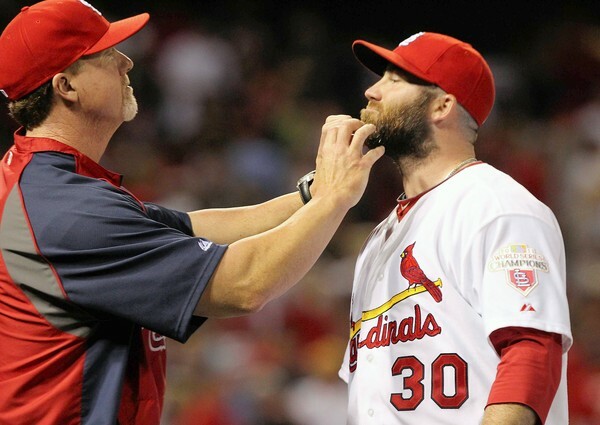 No more beard massages for Jason Motte — or not from Mark McGwire, anyway. After three seasons as hitting coach for the Cardinals, McGwire is leaving to take the same position with the Los Angeles Dodgers, according to the St. Louis Post-Dispatch. Even the Dodgers are citing that same report on their home page, although they’ve made no official announcement yet. Though the Cardinals withheld comment Friday, McGwire notified numerous players and members of the club’s baseball operations of a pending announcement as well as his appreciation for the time spent as hitting coach in St. Louis. The club extended McGwire the opportunity to return, but the geography and family ties led him to pursue an opportunity on Dodgers manager Don Mattingly’s staff. Strauss further reports, in the way only Joe Strauss can, that the Cardinals “may also announce assistant hitting coach John Mabry’s promotion as McGwire’s replacement” on Monday when they “are expected to confirm” that Blaise Isley will be promoted from pitching coach at Triple A Memphis to Cardinals bullpen coach. Mabry was the assistant hitting coach this season. In other news on Friday, the Cardinals have made now-free agent Kyle Lohse a one-year qualifying offer worth $13.3 million that would guarantee the Cards receive an extra draft pick if he signs elsewhere. Lohse, of course, also has the prerogative to accept the one-year deal, which would be binding. That decision must be made within the next seven days. Lohse is, however, expected to pass on the offer, which would allow him to explore multiyear deals with other interested clubs. This implementation of qualifying offers is a new wrinkle to the offseason. It was created in the Collective Bargaining Agreement last December and replaces the Type A/B free-agent compensation system. In this system, clubs can decide whether to make a qualifying offer to any free agent who spent the full season on that team. No qualifying offer was made to Lance Berkman, the Cards only other free agent. And does it come as any surprise at all that Astros general manager Jeff Luhnow is going to talk to LB and determine if he has interest in returning to Houston?